I saw these beguiling pink leather slippers on my recent visit to Historic Deerfield. While I am still researching the shoemaker, Pelatiah Rea and his "Variety Shoe Store," the existence of a labeled Boston shoe from the early 19th century is a true find. According to catalog information, Rae may have been born in 1771, married Patty Rolf in 1795 and Emily Powers in 1821 - all in Boston. The shoes themselves have a delicate, winsome quality. The pink leather shows use, and the imprint of the wearer's foot. The leather sole is very thin and clearly good for indoors or dancing. They certainly would never have lasted in the New England winters. The label is revealing as well to the careful reader. The term "Variety Shoe Store" has a more contemporary sensibility, indicating a wide selection from which to choose. In a clever tactic to bring consumers into the shop, Rea notes "Rips mended gratis." 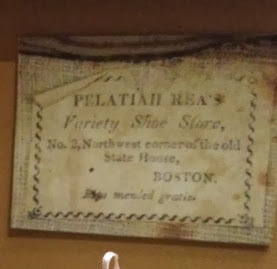 Finally, though it is only the early years of the 19th century, the location is near the "Old State House." The 'new' Statehouse had just been completed in 1798 by architect Charles Bulfinch (1763-1844). Throughout the 19th century, the original downtown core of Boston became associated with the older, densely populated parts of the city. The commercial center would become more linear, shifting down Washington Street (present day downtown crossing). I thought readers might enjoy installation photos of the shoes on exhibit - as an added incentive to visit the "Celebrating Fiber Arts" exhibit currently on view through December 29, 2013. All images are courtesy of Historic Deerfield.